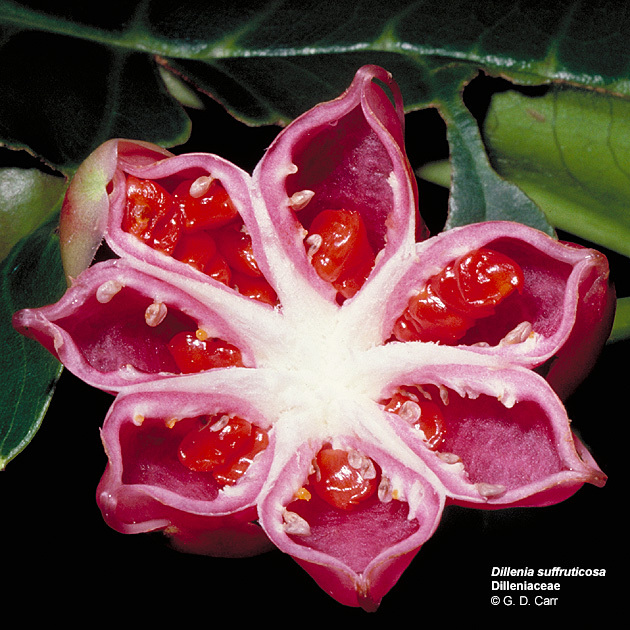 The Dilleniaceae are trees, shrubs or occasionally vines comprising 10 genera and about 350 species. The leaves are simple and alternate, the stipules are absent or wing-like and adnate to the petiole. 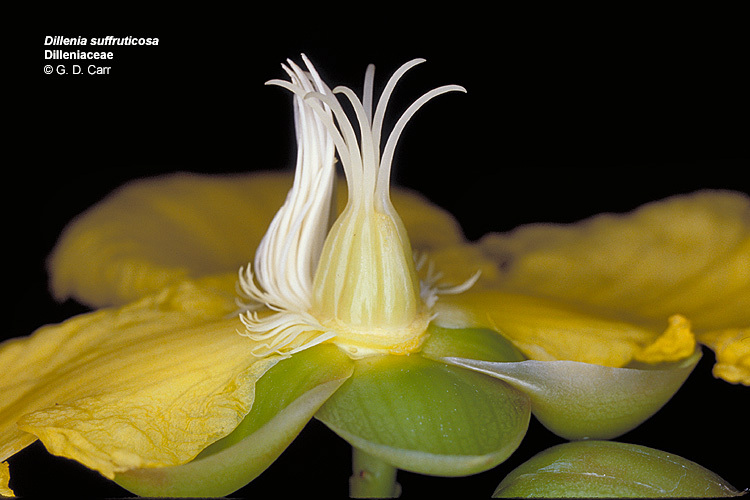 The flowers are actinomorphic and are bisexual or rarely unisexual. The perianth consists of 5 imbricate sepals and usually 5 imbricate petals. The androecium consists of numerous, distinct or fascicled stamens. The gynoecium comprises several distinct, simple pistils, each with a superior ovary and a single locule containing 1-many ovules. The fruit is a follicle or is berrylike. 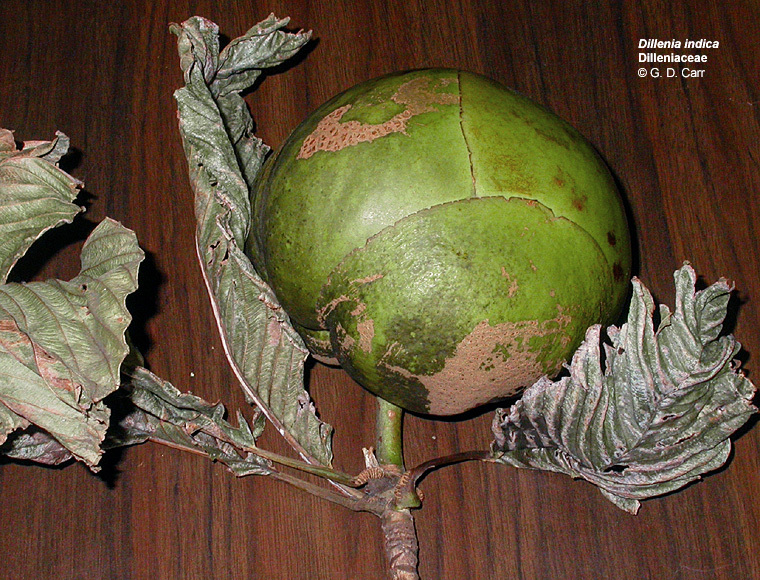 Dillenia indica, elephant apple. 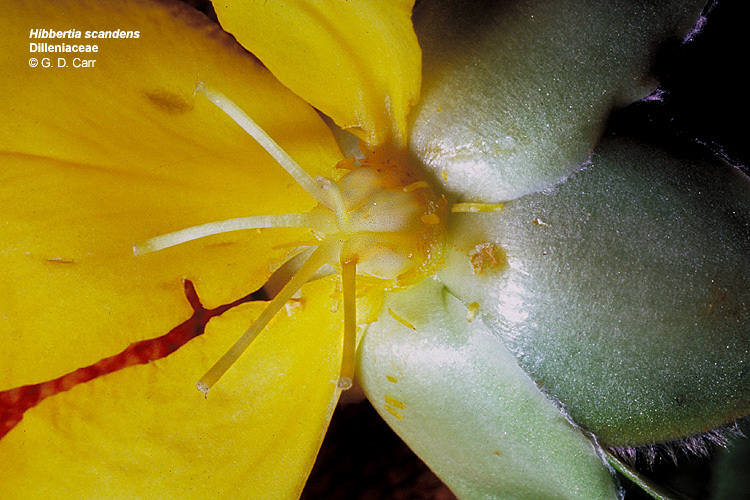 1 - With two of the petals removed, the overlapping or imbricate sepals are partially visible. 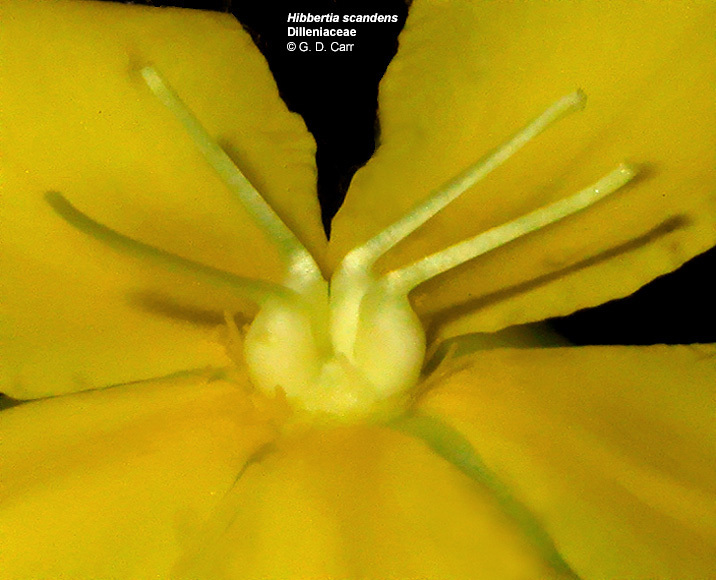 Also, the numerous stamens and the upper part of several pistils can be seen. 2 - This photo shows an early stage in the development of the fruit. 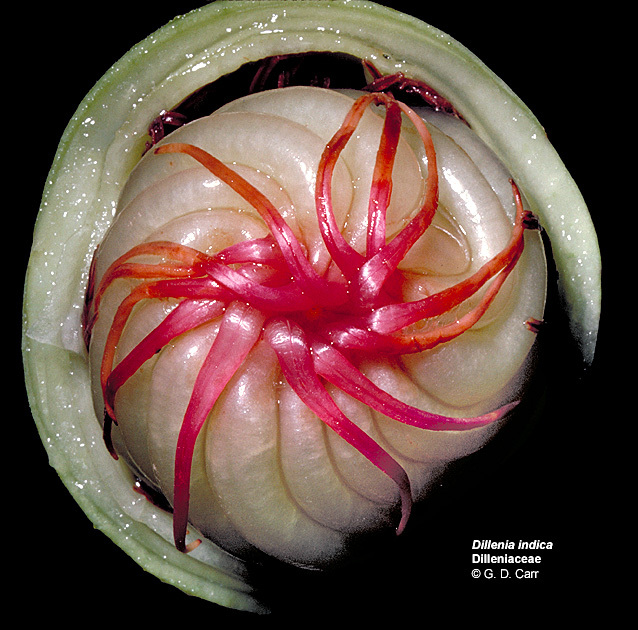 The upper part of the persistent calyx has been cut away to reveal the several pistils that are somewhat spirally twisted. The pink reflexed styles are still apparent at this early stage. 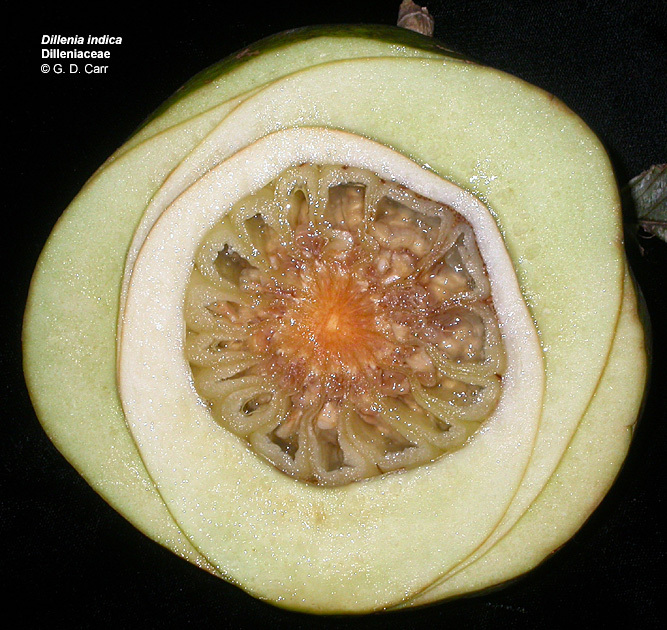 3-5 - The fruiting structure remains inside the persistent calyx and eventually reaches 3 to 5 inches in diameter. 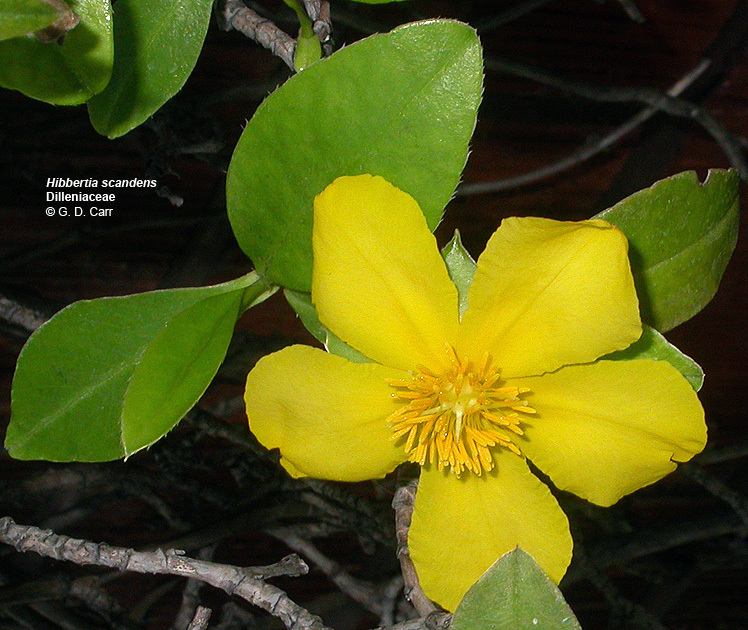 Dillenia suffruticosa, shrubby simpoh. 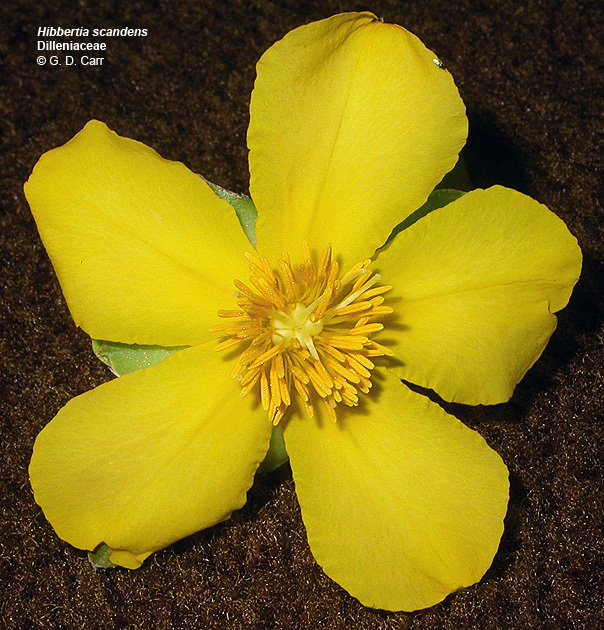 1 - Five petals, many stamens, and several pistils are visible in the left photo. 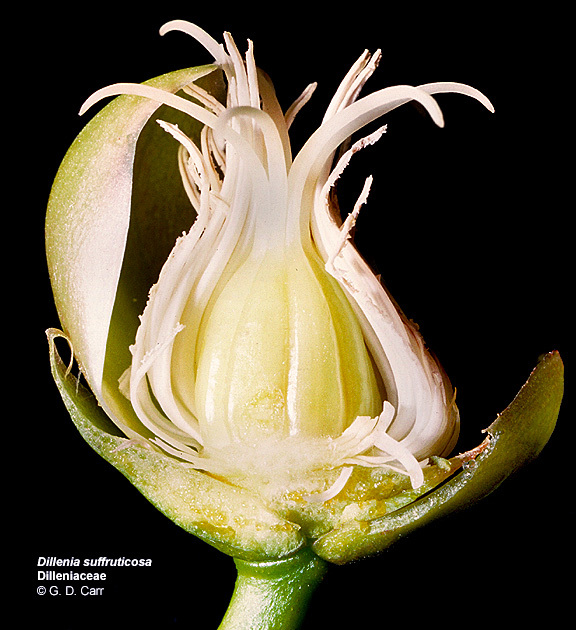 2 - In the 2nd photo parts of the flower have been removed to reveal overlapping sepals and the gynoecium consisting of several pistils that are united to an elongated receptacle. 3 - more parts removed. 4 - At maturity each pink pistil pulls away from the white receptacular tissue and splits open along the inner margin in the fashion of a follicle. The seeds that have developed are enclosed in a bright red aril that originates from the seed stalk or funiculus. 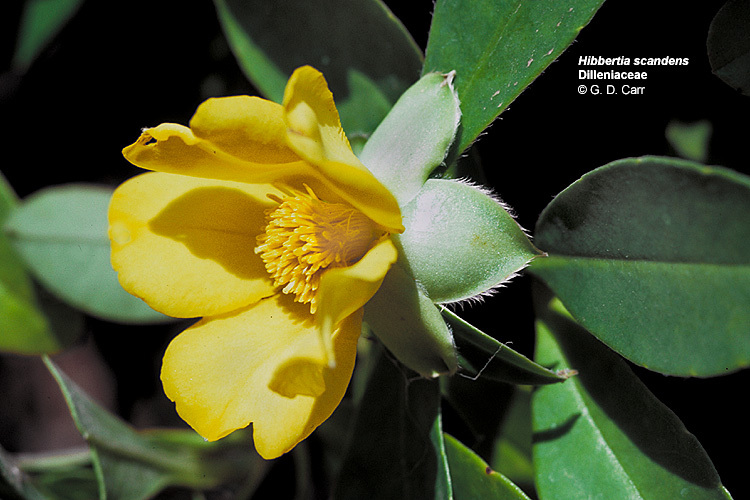 Hibbertia scandens, snake vine. 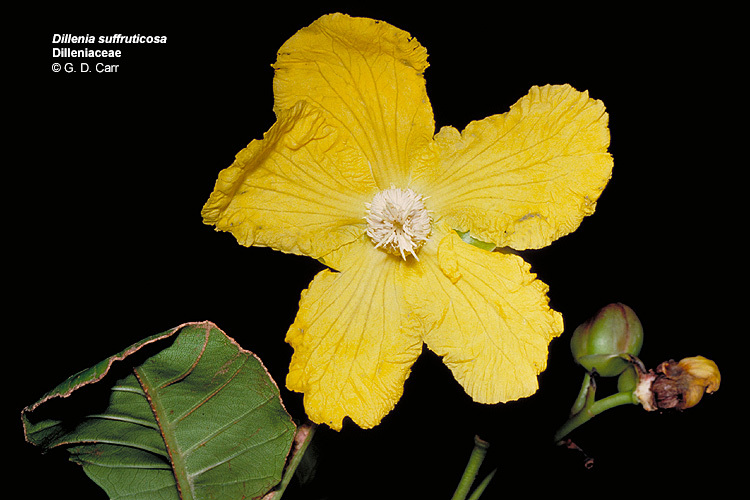 With the many stamens and two petals removed from the flower on the right, the apocarpous gynoecium and imbricate sepals are visible.